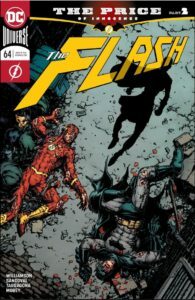 Batman and the Flash share a great sense of loss…and guilt. Batman was one of the architects of Sanctuary, the healing place for heroes where Wally and so many others died in HEROES IN CRISIS. Barry Allen carries guilt for sending Wally there. Now, can they work together…or will they tear themselves apart for good? 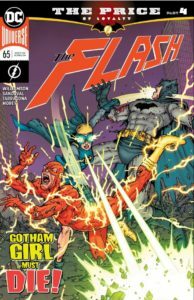 We begin with “The Price of Justice”, the first of four crossover issues with Batman and The Flash. Want to know more? Follow us after the jump! 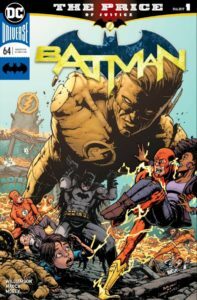 This entry was posted in Reviews and tagged Amazo, Barry Allen, Batman, Bruce Wayne, Flash, Flash Museum, Gotham, Gotham Girl, Heroes in Crisis, Justice League, Review, The Flash, Wally West on February 6, 2019 by Ed Garrett.